EASPD believes the extension of the European Fund for Strategic Investment must include a stronger focus on supporting and empowering those most disadvantaged in society to thrive. Supporting adequate investment into social infrastructure must be a priority for the European Union to achieve Jean-Claude Juncker’s social triple A for Europe. In a position paper launched today, EASPD outlines three major steps for EFSI to achieve this: capacity building for social actors, better targeting the social sector and earmarking for social projects. On 14th September, the European Commission proposed to extend and empower the European Fund for Strategic Investments (EFSI 2.0), a European instrument aimed at unlocking billions of private investment into the economy. According to research made by EASPD, there is very little evidence of any significant investment into social services through this mechanism. Mr Thomas Bignal, Policy Officer EASPD, stated that “despite an increase in demand due to demographic and social changes, funding for social services has dropped in all EU countries. This has led to important gaps between current levels of investment and the much higher investment needs of many social services. Wasn’t the EFSI created to precisely meet these unmet gaps in investment?”. Earlier this year, EASPD published a study assessing how social services could access EFSI. Although the instrument is open to all sectors, the study demonstrated that the reality was far different with clear barriers for the sector to successfully access the instrument and under 1% of EFSI being invested into social services. To ensure that EFSI 2.0 fills in the investment gap for social services and contributes further to social inclusion in Europe, EASPD proposes amendments to the European Commission proposal for policy makers to consider. The amendments cover three main areas: Capacity building by significantly strengthening access to technical assistance at national and regional level; Better targeting by creating sectoral investment platforms at national and regional level for sectors with limited access to EFSI Earmarking for social infrastructure to support social and economic inclusion in Europe; in particular for the growing numbers of disadvantaged people and the over 120 million people living in poverty and social exclusion in Europe. 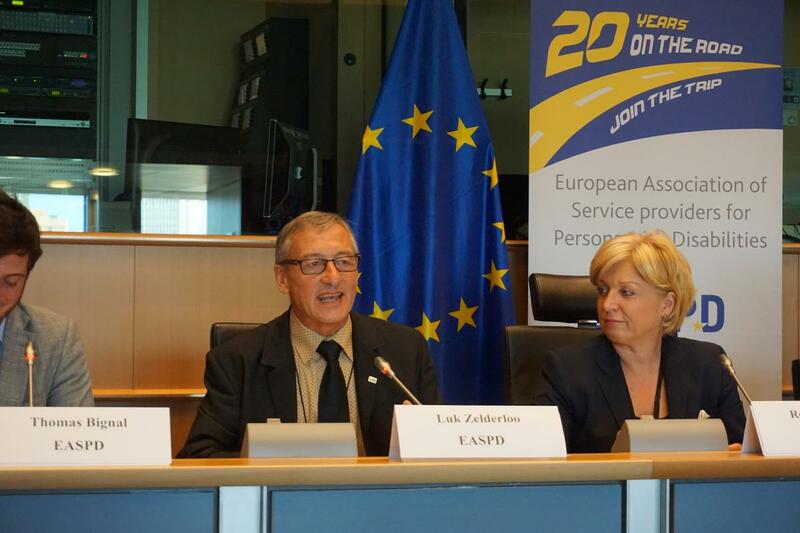 Mr Luk Zelderloo, Secretary General EASPD, calls on Members of the European Parliament and the Council to “ensure that EFSI 2.0 makes a real difference for people in Europe and creates the right environment which will allow people and society to thrive” adding “what better way is there to do just that than by investing and modernising social services, schools, hospitals and social housing. This would create a win-win situation: creating new jobs and creating an enabling environment for all”. 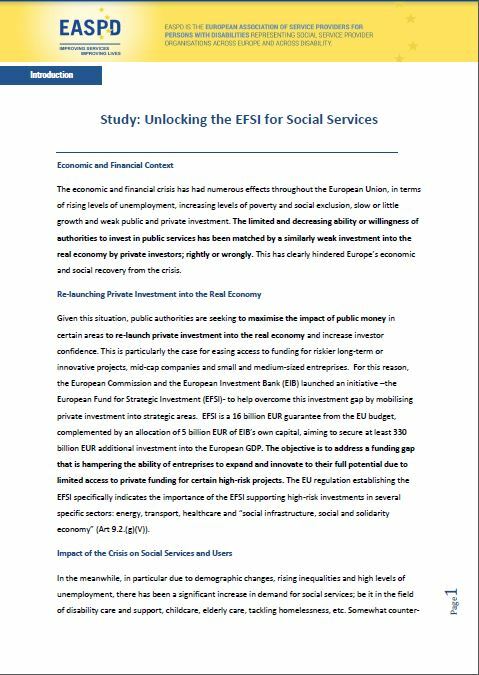 Related documents EASPD Proposed Amendments to EFSI 2.0 as proposed by the European Commission (November 2016) EASPD press release : Time for EU Investment Plan to do more for Social Services EASPD Study: Unlocking the EFSI for Social Services EASPD State of Play Briefing on EFSI and Social Services in English / in French Download the press release in pdf format. Note to editors EASPD is a non-profit European organisation, established in 1996, and currently representing over 12.000 social and health services for persons with disabilities. EASPD advocates for effective and high-quality disability-related services in the field of education, employment and individualised support, in line with the principles of the UN CRPD. EASPD promotes equal opportunities for persons with disabilities through the provision of individualised services. The EASPD network supports and promotes the structural cooperation with all stakeholders in society as well as innovation in the sector. EASPD also calls for fair working conditions and training for professionals working in services for people with disabilities.